Love this eco-friendly product for such a great price. Not only did the bags turn out great but my ordering process went so smoothly. I'm extremely excited to have purchased these eco-friendly bags in such a sizable amount. Much needed for my upcoming convention! Thanks a lot. The designs are terrific. I highly recommend using Custom Earth Promos! The full color bags I purchased are super durable and extremely affordable. Also, they are very unique and were a huge hit at my last trade show. Unbeatable price and super high unique quality. Great bags and great for the environment. Nothing to complain about. Highly recommend using this company. Wow! Great website so easy to maneuver through everything and great customer service. Very pleased to have purchased what I wanted and have absolutely no hassles. Cost efficient and great for the environment! Make sure to buy in bulk, so you get the best deal possible. We received great customer service from Custom Earth Promos and the quality of the bags we received definitely matched the service. The style of this bag in particular is awesome! Custom Earth Promos has great styles! Very happy about our recent bulk purchase with their white and black tote bags. Can't wait to order water bottles next! A stylish bag that has worked well for our companies promotional goals. This is the perfect bag for when you want a more stylish option without breaking the bank! I was attracted to these totes because of their professional appearance. They are the perfect fit for my clients! The quality of these bags still continues to amaze me! CEP definitely takes their materials seriously. I love these bags! They offer a much more stylish way to go green. 80 GSM polypropylene is a great material for a durable bag. Maintaining an eco-friendly purchasing mentality is always in the fore front for our company. Cant order enough of the recycled tote bags. They are so versatile and classy. Very happy with my purchase. The metal accents on this bag really provide a more high class, stylish look. These bags are absolutely perfect for our company. These bags are the perfect size! Big enough for everything you need but not too bulky at the same time! The extra thick handles on this tote is ideal for my clients. We almost love these more than they do! Our company has "gone green" over the last couple years, and ordering these earth-friendly non-woven tote bags has allowed us to stay with that goal. Our product logo looks amazing on these eco-friendly totes. A great look to these eco-friendly tote bags. They are strong and cost effective for a company working on a small budget. The earth-friendly non-woven tote bags are always a huge hit at the trade-shows I frequent. I always have great options when customizing my bags and save some money too. Ordering in bulk from Custom Earth Promos is the way to go. We customized these totes for the hospital. A great way to give back and expose our name throughout the country. We love an earth-friendly concept. The totes really improved our marketing campaign at all the trade shows. Great delivery time on such a large order. Getting 25,000 bags delivered in such a small window of time is very impressive and has only solidified me continuing to do business with Custom Earth Promos. I was amazed at the drastic discount I got because I ordered in bulk. I will continue to do so knowing how much more product I can get for considerably less money. Such a simple process to produce such an impressive marketing tool. We love to support the eco-friendly cause as well. Thanks for all your help. The attention to detail on these promotional tote bags is outstanding; they feature durable and premium fabric, extra durable handles, long enough for multiple carrying techniques, and a removable plastic bottom insert. These modern, color-accented, reusable bags will outshine the rest while displaying your custom message in one (or more) of our many bold imprint colors! 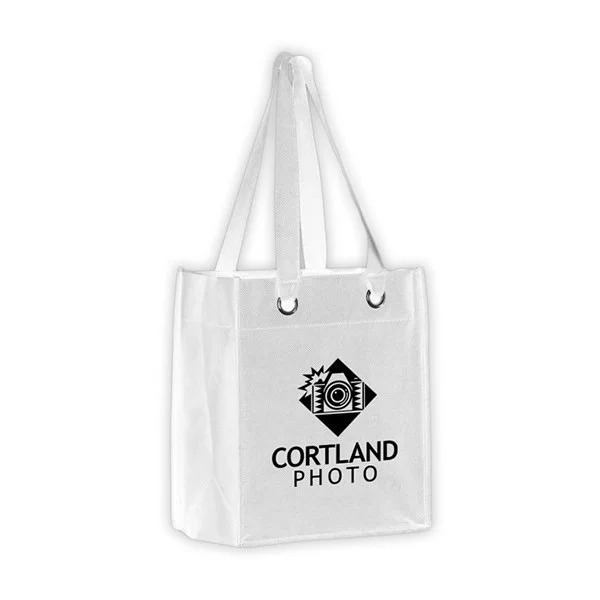 Our non-woven tote bags are a customer favorite! Your custom logo printed on our bags will be sure to turn heads while carrying your brand and helping the planet! Ideal for spas, hotels, health care, beauty, and corporate events, the upscale look and feel of these chic reusable bags are sure to impress. Made for long-term durability and a retro look, our fun-to-carry reusable bags are an excellent choice for your promotional needs. The attention to detail is what make this bag such a hit; from the large, premium grommets to the wide handles, our wholesale tote bags are stylish and built to last! What you will notice the most about this bag is its practicality; its not too bulky, but still rigid and sizable enough to tote around your daily essentials or a few groceries comfortably. Surprisingly, not all non-woven polypropylene is created equal - we at Custom Earth Promos hand select fabric to meet our rigorous quality control standards for texture, thickness, and appearance. All of our products are California Proposition 65 compliant, and independently tested well below the legal limits for heavy metals including lead, cadmium, and chromium. Show your customers you care about the future of our planet, and let them know that even one bag can make a difference in our ecosystem by ordering your eco bags from Custom Earth Promos. Order the stylish, non-woven tote bag direct overseas and see your artwork come to life with a FREE custom trim and handle to accent the expanded imprint area! Not only will you have the ability to choose every aspect of your bag's design, the wholesale low prices our overseas factory have to offer will fit any budget. Overseas bags come in several color options, or you can print an exact PMS color match for orders of 10,000 pieces or more. Promoting the use of eco-friendly reusable bags by handing them out at your next event DOES make a difference: every bag counts! Custom Earth Promos' team of talented graphic designers and production managers will work day and night to ensure your custom recyclable bags are made exactly as you envision them, with quality materials, perfectly printed designs, and excellent craftsmanship. 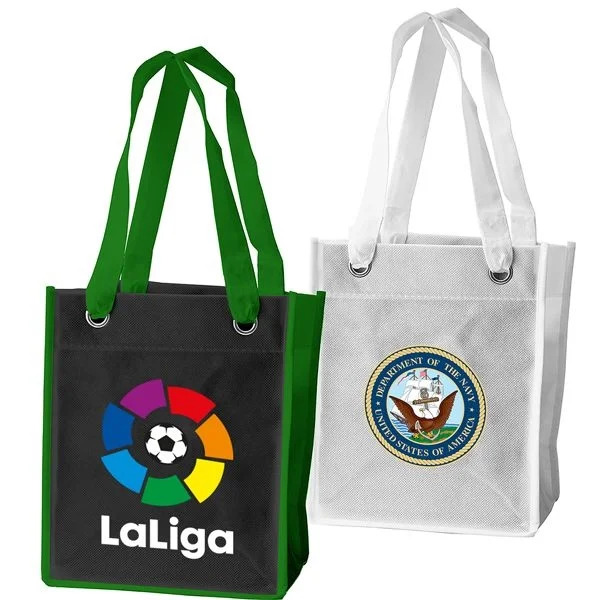 Let us produce your promotional tote bags directly overseas and see the results for yourself!